1. 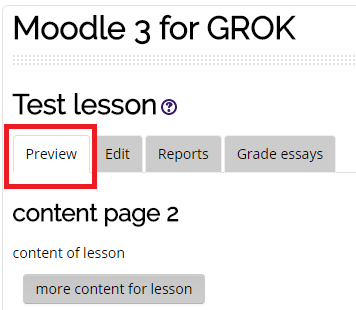 Open up your Moodle page and select the lesson report you would like to view. 2. On the lessen report page select the preview tab. The student can preview their score at any time but the teacher must switch their role to student in order to see the score. 1. Select the Reports tab. 2. 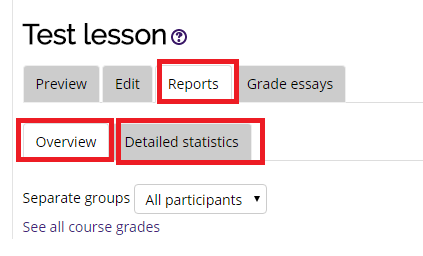 The reports tab shows the performance of students taking the lesson. There is a general "overview" and a "detailed statistics" tab within the reports tab. 2. Completed essays will be listed next to the students name. Ungraded essays will appear in red, graded essays will appear in yellow, and once the lesson is graded and emailed to the student it will appear in green.